Can you Reheat Hot Dogs? | Can You Reheat? Can you Reheat Hot Dogs? I boil hot dogs, is there any way to reheat them? I know, I know, they are terrible for my health, but when I need a quick fix for lunch, it is better than going and getting fast-food. We all make choices. While the health benefits are debatable, reheating this is nothing to contend with. From saving leftovers from a grill out to just making dinner, hot dogs are great as a second-day leftovers. You have a variety of options to reheat them, depending on how much time you have. You can pan fry them, microwave, or even put them in the oven if you have a lot to reheat. Can you reheat hot dogs? Pan frying is one of the easiest methods other than microwaving. Simply find a stove-safe pan and place your hot dog into the pan. Warm over medium-low heat. You may cover with a lid if you desire; however the hot dog will reheat in the same amount of time either way. Be sure to move the hot dog around the pan with a fork or small spatula to ensure one side does not burn. When you are on the go, simply wrap a hot dog in a paper towel, and microwave for 30 seconds on high. Check for the desired temperature by feel. If your hot dog splits at the edges, it is hot and slightly overcooked. If you want a warmed bun, simply place it in at the last 7 seconds of microwaving for perfectly soft bread! Reheating a single hot dog in the oven is not quite energy efficient, however, if you have upwards of 10 or more, this is a great method! Place a layer of aluminum foil on a baking sheet and preheat your oven to 325 degrees F.
Layer place hot dogs in a single layer and cover with foil to prevent overcooking. Bake for five minutes, or until there is a slight color difference. Be sure to keep an eye on them as they tend to cook very quickly! 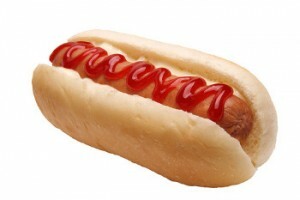 Regardless of the need, a hot dog is a quick fix when you are looking for something to eat. These easy reheating methods ensure that you can get on with your day without too much hassle. *Did you know you can cook a hot dog from “raw” in the microwave in less than a minute?